So I read where the Grand Rapids Community Foundation is funding nearly $30K to the Creston Neighborhood Association to assist among other things in establishing a Business Improvement District. I've seen businesses try to get a toehold along Plainfield, some successfully such as Red Jet Cafe, others not so succesfully such as Wired Espresso. The area seems to have a rep as a haven for slumlords which attracts correspondingly undesirable occupants. All in all it sounds like the association has an uphill battle ahead of them. Does this area honestly have the potential to be revitalized anytime soon? What will it take? Will there need to be a fundamental change in the demographics especially from Leonard to Sweet? I have scratched my head about this area for quite some time. There's been a lot of work done in Creston over the last few years, it's all coming together very nicely recently. The North Quarter Corridor Improvement District was officially approved in May. 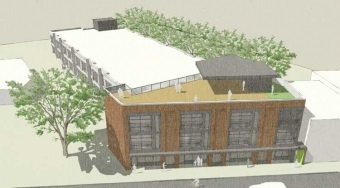 You can see their full proposal on Creston Neighborhood Association's website. Construction just started on Plainfield Avenue and includes the addition of seven bio-retention islands. These are the first in Grand Rapids and about half the money was raised locally, the business community in Creston stepped up big time and supported the project. FOX 17 did a nice piece on it back in February. (This isn't our only green project, Our Living Green in Creston group supported the planting of the first urban orchards in GR last summer, in Briggs and Aberdeen parks). And Red Jet is far from the only successful business in Creston! There's Graydon's Crossing, Sazerac Lounge, Choo Choo Grill, Stonesthrow, GR8 Tastes (in the former Wired space), Cheshire Grill, Kingma's, Sweetlands, Dorothy & Tonys, etc. Off the top of my head I can count five buildings south of Sweet Street that got facelifts in the past few years, plus one currently underway. Now, I'm admittedly biased. 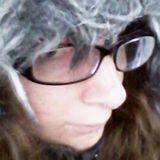 I live in Creston and I volunteer with the neighborhood association. But, I chose to buy a house in the neighborhood and to get involved because I see tons of potential. There's plenty to talk about in Creston and I'm surprised that things in the neighborhood aren't mentioned here on UrbanPlanet more often (I'm a frequent lurker and very rare commenter). The question isn't whether or not it will be revitalized, because it's already happening. The question is how successful it will be moving ahead. Help us out and come shop and eat in the area. Stonesthrow is great! We bought most of our new furniture there. It's a one-of-a-kind-in-GR furniture shop too... huge asset for that neighborhood (and a great excuse to have dinner at Red Jet after shopping). Agreed. Stonesthrow and Huizen's (same company) are the best furniture spots around, IMO. As for Creston, I think there's tons of potential there and I'm glad they formed the CID. You're absolutely right, gvsusean. Looks like I have to have 10 posts before I can upload images, and I'm not having any luck inputting them from Flickr (unless I'm missing something ridiculously obvious). I'll find some things to comment on and come back soon with pics. Okay, I'd rather have these pics appear in the posting... but may as well link them now. This is a building at 1410 Plainfield (at Spencer Street) that is getting a major facelift. Check out a before picture (this one from August 2010). It's quite a difference. I only hope that the finished product will look good - I have no idea who's doing the work or what's going in the building when they're done. The owners of Sun Title (located in the building just north on Plainfield -- to the far left in the picture) purchased the building and are renovating it. They went to the library to get original pictures of the building before it was skinned and wanted to reveal the original facade. Based on their current building, I would expect the finished product to be very nice. The Creston area community was impressive in how fast and hard they rallied and raised money for the Plainfield improvement project. That's great news, they did a really nice job on the Sun Title remodel. I'm looking forward to seeing the finished product even more, now! Thanks for the info, grnd. what I want to know is why someone would cover up brick with crappy vinyl siding. or at least what looks like that in the pictures. The light colored vinyl siding is the "before" picture. The red painted brick is the after picture (still unfinished yet). Although I have seen brick houses get covered in vinyl before, and someone clearly thought it looked better on this building at some point. I am going to give jas49503 some credit and assume that he was referring to the misguided owner who was responsible for the first renovation. ... This is a building at 1410 Plainfield (at Spencer Street) that is getting a major facelift. You can always post some links to Streetview images. And then a new post with a Bing link. Closing in on the magical ten posts! BTW, thanks for joining us! Nice restoration on the building but that Sun Title sign is a bit of a turd in the punchbowl now isn't it? Love the finished project - the inside and outside of the building look great. It makes me happy to drive by everyday and see the renovated building instead of the ugly structure that it used to be! A slew of projects announced today for Creston: 616 is redeveloping the old Break Room site (which I hinted at a few weeks ago), Gilmore is looking at the rooftop deck on Red Jet again, and the Creston Market is set to get an expansion. Brief WoodTV report on it. Great to see Creston get some love. Be careful though. You dont want to sully the historical vibe of the neighborhood with that building design.! The designs look perfectly fine to me, I actually rather like the design of what's being proposed. According to the city planning commission agenda for next week, it looks like 616 has another good sized project lined up on Plainfield. Oh yeah, their second development in Creston. Essentially right across the street from Red Jet Cafe. Back in October 2014, 616 Development announced plans for a 40 unit market rate apartment building at 1359 Plainfield. At the site of the former Break Room. This building would have included 3000 sf of retail. This building appears to be canceled and the Break Room property is now part of a larger redevelopment that includes a parcel to the south. 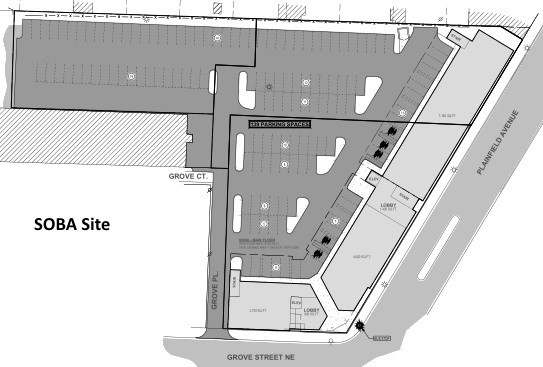 From what I can tell in the planning commission packet the new proposed building at the NW corner of Grove & Plainfield will have 99 apartments with retail space on the ground floor. 616 is calling this the SOBA Site. Also back in October 2014, 616 Development mentioned that they had an option to buy 220 Qiumby. They now own 220 Quimby and three other lots next to it. 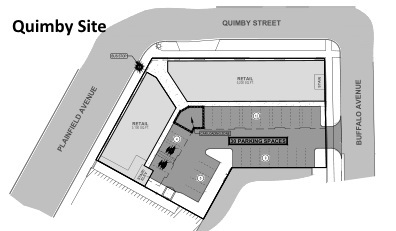 They are calling this the Quimby Site and are proposing a 60 unit apartment building with ground floor retail. 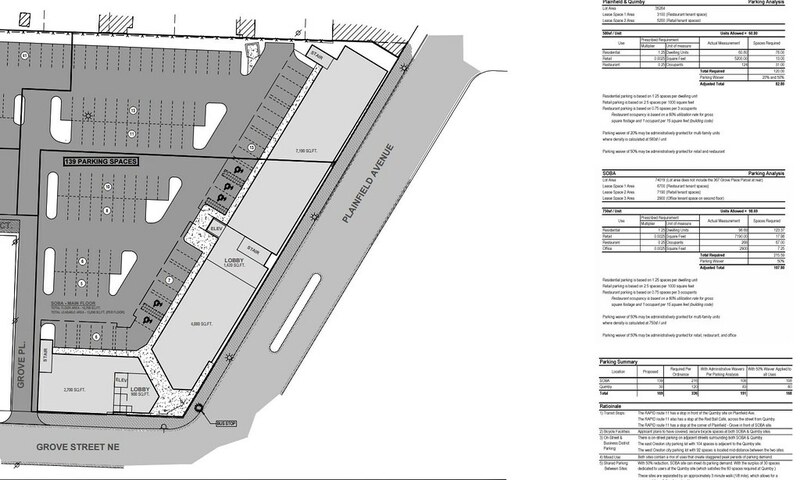 What 616 is asking the Planning Commission is for a waiver to reduce some of the required parking at the Quimby Site. 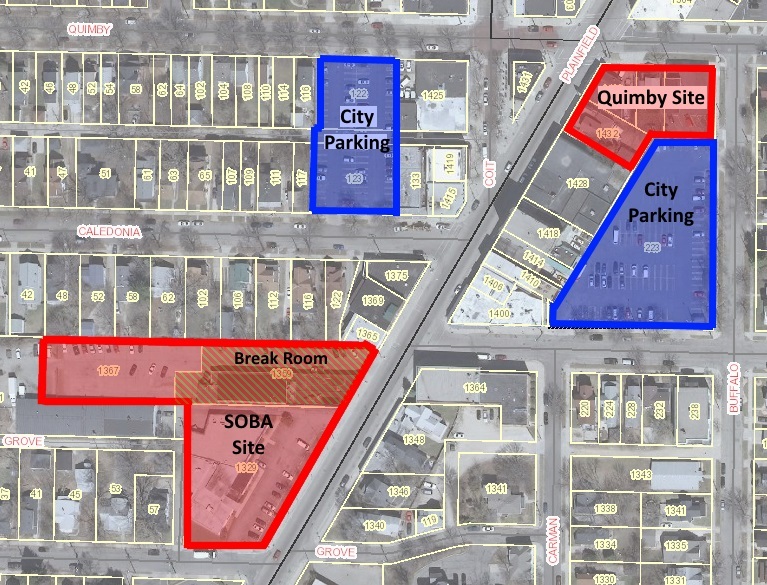 And also a waiver to use some of the parking at the SOBA Site for the Quimby Site.